Lyrical Abstraction is either of two related but distinctly separate trends in Post-war Modernist painting, and a third definition is the usage as a descriptive term. It is a descriptive term characterizing a type of abstract painting related to Abstract Expressionism; in use since the 1940s. Many well known abstract expressionist painters like Arshile Gorky seen in context have been characterized as doing a type of painting described as lyrical abstraction. The second common use refers to the tendency attributed to paintings in Europe during the post-1945 period and as a way of describing several artists (mostly in France) whose works related to characteristics of American abstract expressionism. At the time (late 1940s) Paul Jenkins, Norman Bluhm, Sam Francis, Jules Olitski, Joan Mitchell, Ellsworth Kelly and numerous other American artists were living and working in Paris and other European cities. With the exception of Kelly all of those artists developed their versions of painterly abstraction that has been characterized at times as lyrical abstraction, tachisme, color field, and abstract expressionism. Finally in the late 1960s (partially as a response to minimal art, and the dogmatic interpretations by some to Greenbergian and Juddianformalism) many painters re-introduced painterly options into their works and the Whitney Museum and several other museums and institutions at the time formally named and identified the movement and uncompromising return to painterly abstraction as lyrical abstraction. European Lyrical Abstraction is an art movement born in Paris after World War II. At that time, France was trying to reconstruct its identity devastated by the Occupation and Collaboration. Some art critics looked at the new abstraction as an attempt to try to restore the image of artistic Paris, which had held the rank of capital of the arts until the war. It is possible that lyrical abstraction also represented a competition between Paris and the new American school of painting, Abstract Expressionism, based in New York and represented by Jackson Pollock,Willem de Kooning and many others. It could thus be seen as the School of Paris versus the New York School. Lyrical abstraction was opposed not only to Cubist and Surrealist movements that preceded it, but also to geometric abstraction (or "cold abstraction"). Lyrical abstraction was in some ways the first to apply the lessons of Kandinsky, considered one of the fathers of abstraction. For the artists in France, lyrical abstraction represented an opening to personal expression. Post World War II France was trying to reconstruct her identity devastated by the Occupation and Collaboration. Some art critics have looked at the new abstraction as an attempt to try to restore the image of artistic Paris, who had held the rank of capital of the arts until the war. Just after World War II, many artists old and young were back in Paris where they worked and exhibited : Nicolas de Staël, Serge Poliakoff,André Lanskoy and Zaks from Russia; Hans Hartung and Wols from Germany; Árpád Szenes and Simon Hantaï from Hungary; Alexandre Istratifrom Romania; Jean-Paul Riopelle from Canada; Vieira da Silva from Portugal; Gérard Ernest Schneider from Switzerland; Feito from Spain;Bram van Velde from Holland; Albert Bitran from Turkey; Zao Wou Ki from China; Sugai from Japan; Sam Francis, John Koenig, Jack Youngerman and Paul Jenkins from the U.S.A.
All these artists and many others were at that time among the “Lyrical Abstractionists” with the French : Georges Mathieu, Pierre Soulages, Nallard, Jean René Bazaine, Doucet, Camille Bryen, Jean Le Moal, Gustave Singier, Alfred Manessier, Roger Bissière, Pierre Tal-Coat etc. Lyrical Abstraction was opposed not only to “l’Ecole de Paris “ remains of pre-war style but to Cubist and Surrealist movements that had preceded it, and also to geometric abstraction (or "Cold Abstraction"). Lyrical Abstraction was in some ways the first to apply the lessons ofKandinsky, considered one of the fathers of abstraction. For the artists in France, Lyrical Abstraction represented an opening to personal expression. In Belgium, Louis Van Lint figured a remarkable example of an artist who, after a short period of geometric abstraction, has moved to a lyrical abstraction in which he excelled. Many exhibitions were held in Paris for example in the galleries Arnaud, Drouin, Jeanne Bucher, Louis Carré, Galerie de France, and every year at the “Salon des Réalités Nouvelles” and “Salon de Mai” where the paintings of all these artists could be seen. At the Drouin gallery one could see Jean Le Moal, Gustave Singier, Alfred Manessier, Roger Bissière, Wols and others. A wind blew over the capital when Georges Mathieudecided to hold two exhibitions: L'Imaginaire in 1947 at the Palais du Luxembourg which he would have prefer to call Abstraction Lyrique to impose the name and then HWPSMTB with (Hans Hartung, Wols, Francis Picabia, François Stahly sculptor, Georges Mathieu, Michel Tapiéand Camille Bryen) in 1948. In March 1951 was held the larger exhibition Véhémences confrontées in the gallery Nina Dausset where for the first time were presented side to side French and American abstract artists. It was organised by the critic Michel Tapié, whose role in the defense of this movement was of the highest importance. With these events, he déclared that « the lyrical abstraction is born ». It was, however, a fairly short reign (late 1957), which was quickly supplanted by the New realism of Pierre Restany and Yves Klein. Starting around 1970, this movement has been revived by a new generation of artists born during or immediately after the Second World War. Some of its key promoters include Paul Kallos, Georges Romathier, Michelle Desterac, and Thibaut de Reimpré. An exhibition entitled "The Lyrical Flight, Paris 1945–1956" (L'Envolée Lyrique, Paris 1945–1956), bringing together the works of 60 painters, was presented in Paris at the Musée du Luxembourg from April to August 2006 and included the most prominent painters of the movement :Georges Mathieu, Pierre Soulages, Gérard Schneider, Zao Wou Ki, Albert Bitran, Serge Poliakoff. An exhibition entitled The soaring lyrical, Paris 1945-1956, bringing together the works of 60 painters, was presented in Paris at the Musée du Luxembourg from April to August 2006. Ronnie Landfield, For William Blake1968, a/c, 110 x 256 inches, exhibited: Tower 49, NYC, January 3, 2002–November 15, 2002. American Lyrical Abstraction is an art movement that emerged in New York City, Los Angeles,Washington, DC, and then Toronto and London during the 1960s–1970s. Characterized by intuitive and loose paint handling, spontaneous expression, illusionist space, acrylic staining, process, occasional imagery, and other painterly and newer technological techniques. Lyrical Abstraction led the way away from minimalism in painting and toward a new freer expressionism. Painters who directly reacted against the predominating Formalist, Minimalist, and Pop Art and geometric abstraction styles of the 1960s, turned to new, experimental, loose, painterly, expressive, pictorial and abstract painting styles. Many of them had been Minimalists, working with various monochromatic, geometric styles, and whose paintings publicly evolved into new abstract painterly motifs. American Lyrical Abstraction is related in spirit to Abstract Expressionism, Color Field painting and European Tachisme of the 1940s and 1950s as well. Tachisme refers to the French style of abstract painting current in the 1945–1960 period. Very close to Art Informel, it presents the European equivalent to Abstract Expressionism. As a movement, Lyrical Abstraction extended the post-war Modernist aesthetic and provided a new dimension within the abstract tradition which was clearly indebted to Jackson Pollock's "dripped painting" and Mark Rothko's stained, color forms. This movement was born out of a desire to create a direct physical and sensory experience of painting through their monumentality and emphasis on color – forcing the viewer to "read" paintings literally as things. Lyrical Abstraction arose in the 1960s and 70s, following the challenge of Minimalism and Conceptual art. Many artists began moving away from geometric, hard-edge, and minimal styles, toward more lyrical, sensuous, romantic abstractions worked in a loose gestural style. These "lyrical abstractionists" sought to expand the boundaries of abstract painting, and to revive and reinvigorate a painterly "tradition" in American art. At the same time, these artists sought to reinstate the primacy of line and color as formal elements in works composed according to aesthetic principles – rather than as the visual representation of sociopolitical realities or philosophical theories. "Early last season, it became apparent that in painting there was a movement away from the geometric, hard-edge, and minimal, toward more lyrical, sensuous, romantic abstractions in colors which were softer and more vibrant…The artist’s touch is always visible in this type of painting, even when the paintings are done with spray guns, sponges or other objects...As I researched this lyrical trend, I found many young artists whose paintings appealed to me so much that I was impelled to acquire many of them. The majority of the paintings in the Lyrical Abstraction exhibition were created in 1969 and all are a part of my collection now." Larry Aldrich donated the paintings from the exhibition to the Whitney Museum of American Art. For many years the term Lyrical Abstraction was a pejorative, which unfortunately adversely affected those artists whose works were associated with that name. 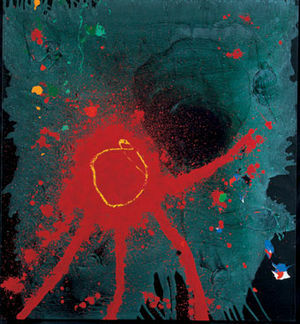 In 1989 Union College art history professor, the late Daniel Robbins observed that Lyrical Abstraction was the term used in the late sixties to describe the return to painterly expressivity by painters all over the country and "consequently", Robbins said, "the term should be used today because it has historical credibility"
The following artists participated in the exhibition, Lyrical Abstraction. Lyrical Abstraction along with the Fluxus movement and Postminimalism (a term first coined by Robert Pincus-Witten in the pages of Artforum in 1969) sought to expand the boundaries of abstract painting and Minimalism by focusing on process, new materials and new ways of expression. Postminimalism often incorporating industrial materials, raw materials, fabrications, found objects, installation, serial repetition, and often with references to Dada and Surrealism is best exemplified in the sculptures of Eva Hesse. Lyrical Abstraction, Conceptual Art,Postminimalism, Earth Art, Video, Performance art, Installation art, along with the continuation of Fluxus, Abstract Expressionism, Color FieldPainting, Hard-edge painting, Minimal Art, Op art, Pop Art, Photorealism and New Realism extended the boundaries of Contemporary Art in the mid-1960s through the 1970s. Lyrical Abstraction is a type of freewheeling abstract painting that emerged in the mid-1960s when abstract painters returned to various forms of painterly, pictorial, expressionism with a predominate focus on process, gestalt and repetitive compositional strategies in general. Characterized by an overall gestalt, consistent surface tension, sometimes even the hiding of brushstrokes, and an overt avoidance of relational composition. It developed as did Postminimalism as an alternative to strict Formalist and Minimalist doctrine. Lyrical Abstraction shares similarities with Color Field Painting and Abstract Expressionism especially in the freewheeling usage of paint – texture and surface, an example is illustrated by the painting by Ronnie Landfield entitled For William Blake. Direct drawing, calligraphic use of line, the effects of brushed, splattered, stained, squeegeed, poured, and splashed paint superficially resemble the effects seen in Abstract Expressionism and Color Field Painting. However the styles are markedly different. Setting it apart from Abstract Expressionism and Action Painting of the 1940s and 1950s is the approach to composition and drama. As seen in Action Painting there is an emphasis on brushstrokes, high compositional drama, dynamic compositional tension. While in Lyrical Abstraction there is a sense of compositional randomness, all over composition, low key and relaxed compositional drama and an emphasis on process, repetition, and an all over sensibility. The differences withColor Field Painting are more subtle today because many of the Color Field painters with the exceptions of Morris Louis, Ellsworth Kelly, Paul Feeley, Thomas Downing, and Gene Davis evolved into Lyrical Abstractionists. Lyrical Abstraction shares with both Abstract Expressionism andColor Field Painting a sense of spontaneous and immediate sensual expression, consequently distinctions between specific artists and their styles become blurred, and seemingly interchangeable as they evolve. Abstract Expressionism preceded Color Field painting, Lyrical Abstraction, Fluxus, Pop Art, Minimalism, Postminimalism, and the other movements of the 1960s and 1970s and it influenced the later movements that evolved. The interrelationship of/and between distinct but related styles resulted in influence that worked both ways between artists young and old, and vice-versa. During the mid-1960s in New York, Los Angeles and elsewhere artists often crossed the lines between definitions and art styles. During that period – the mid 1960s through the 1970s advanced American art and contemporary art in general was at a crossroad, shattering in several directions. During the 1970s political movements and revolutionary changes in communication made these American styles international; as the art world itself became more and more international. American Lyrical Abstraction's European counterpart Neo-expressionism came to dominate the 1980s, and also developed as a response to American Pop Art and Minimalism and borrows heavily from American Abstract Expressionism. This is a list of artists, whose work or a period or significant aspects of it, has been seen as lyrical abstraction, including those before the identification of the term or tendency in America in the 1960s. ^ a b Aldrich, Larry. Young Lyrical Painters, Art in America, v.57, n6, November–December 1969, pp.104–113. ^ The Lyrical Flight, Paris 1945–1956, texts Patrick-Gilles Persin, Michel and Pierre Descargues Ragon, Musée du Luxembourg, Paris and Skira, Milan, 2006, 280 p. ISBN 88-7624-679-7. ^ a b Flight lyric, Paris 1945–1956, texts Patrick-Gilles Persin, Michel and Pierre Descargues Ragon, Musée du Luxembourg, Paris and Skira, Milan, 2006, 280 p. ISBN 88-7624-679-7. ^ The Archives of American Art, Smithsonian, Betty Parsons Gallery Papers, Reel 4087–4089: Exhibition Records, Reel 4108: Artists Files, last names A–B. ^ Ashton, Dore. Young Abstract Painters: Right On! Arts v. 44, n. 4, February, 1970, pp. 31–35. ^ Lyrical Abstraction, exhibition: April 5 through June 7, 1970. ^ Lyrical Abstraction, exhibition: May 25 through July 6, 1971. ^ Robbins, Daniel. Larry Poons: Creation of the Complex Surface, Exhibition Catalogue, Salander/O'Reilly Galleries, p. 10, 1990. ^ Dorment, Richard. "Arshile Gorky: A Retrospective at Tate Modern, review", The Daily Telegraph, 8 February 2010. Retrieved May 24, 2010. Landfield, Ronnie, In The Late Sixties, 1993–95, and other writings – various published and unpublished essays, reviews, lectures, statements and brief descriptives at . Zinsser, John. Larry Poons, an interview reprinted from Journal of Contemporary Art, Fall/Winter 1989, vol.2.2 pp. 28–38. Exhibition Catalogue, Salander/O'Reilly Galleries, pp. 20–24, 1990. Henning, Edward B. Color & Field, Art International May 1971: 46–50. Ratcliff, Carter. Painterly vs. Painted, Art News Annual XXXVII, Thomas B. Hess, and John Ashberry, eds.1971, pp..129–147. Prokopoff, Stephen. Two Generations of Color Painting, Exhibition Catalogue, Philadelphia Institute of Contemporary Art, 1971. Sharp, Willoughby. Points of View, A taped conversation with four painters," Ronnie Landfield, Brice Marden, Larry Poons and John Walker (painter), Arts, v. 45, n.3. December 1970, pp. 41–. Lyrical Abstraction, Exhibition Catalogue, the Aldrich Contemporary Art Museum, Ridgefield, Conn. 1970. Domingo, Willis. Color Abstractionism: A Survey of Recent American Painting, Arts, v. 45.n.3, December 1970, pp. 34–40. Channin, Richard. New Directions in Painterly Abstraction, Art International, Sept. 1970; pp. 62–64. Davis, Douglas. The New Color Painters, Newsweek 4 May 1970: pp. 84–85. Ashton, Dore. Young Abstract Painters: Right On! Arts v. 44, n. 4, February, 1970, pp. 31–35. Ratcliff, Carter. The New Informalists, Art News, v. 68, n. 8, December 1969, p. 72. Martin, Ann Ray, and Howard Junker. The New Art: It's Way, Way Out, Newsweek 29 July 1968: pp. 3,55–63. "L'Envolée Lyrique" ("Lyrical Flight"), Paris 1945–1956, texts Patrick-Gilles Persin, Michel and Pierre Descargues Ragon, Musée du Luxembourg, Paris and Skira, Milan, 2006, 280 p. ( ISBN 88-7624-679-7 ). Gérard Xuriguera. "Les Années 50", Arted, Paris, 1984. Dora Vallier. "L'Art Abstrait", Livre de Poche, Paris, 1980. Michel Ragon et Michel Seuphor. "L'art abstrait", (volume 4 : 1945–1970), Maeght, Paris, 1974.